"This is a great low-carb alternative to your standard homemade tacos. I love Mexican food and wasn't willing to part with tacos after starting my low-carb diet. This always satisfies my craving." Cook and stir ground beef, onion, and jalapeno peppers together in a skillet over medium-high heat until meat is browned and crumbly, 7 to 10 minutes. Stir taco seasoning into meat mixture; bring to a simmer and cook until flavors combine, about 5 minutes. 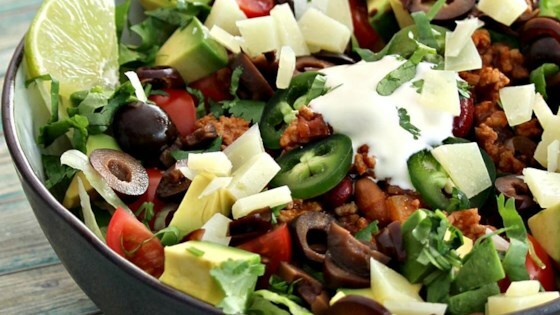 Stir meat mixture, shredded lettuce, tomato, Cheddar cheese, salsa, and sour cream together in a large bowl. Divide taco mixture among 4 bowls and top each with avocado slices. Double decker means twice the taco! Low fat and low carbs are different things. The ratio of Fat to Saturated Fat is high, and this is not a lowfat recipe by any means. Uh...did anyone else notice the picture attached to this recipe shows sliced black olives and avocados? Even so, good low carb recipe for my files. Looks good, can't wait to try. Question: Why are there black olives in the picture but none in the ingredients? You don't need to be watching your carbs to indulge in this recipe. So easy to make with ingredients on hand and eat right out of a bowl. A great blend of overall flavors.